I took two weeks off podcast production to work on a new project for Living Homegrown, so this is the second (and last) encore presentation to hold you over while I’m away. 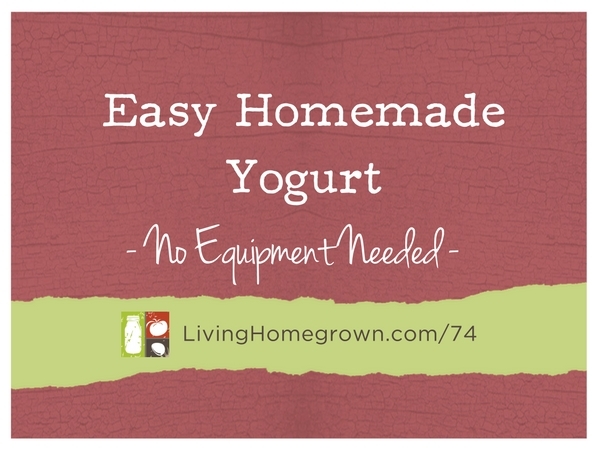 It’s all about how you can easily make yogurt at home at room temperature without any heating or special equipment. Note: All of the cultures listed above are available from Cultures for Health. I am not an affiliate for them and I have no connections with them other than as a customer. I just love their products and wanted to share them as a resource. But there are many other places on the internet where you can buy yogurt cultures if they do not have what you are looking for. I was wondering if you have tried using raw milk with the Greek yogurt culture? Did you have to hear it up? Thanks been loving your podcasts!